St Patrick’s Day was celebrated in style today. 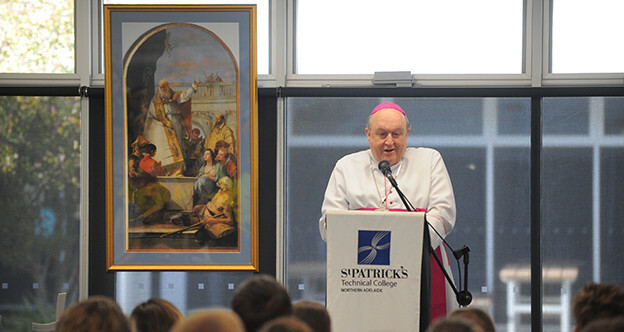 The college community was delighted to welcome Archbishop Philip Wilson to lead a special St Patrick’s Day liturgy. The Archbishop was also assisted by our local parish priest, Fr Pat Woods. As part of the liturgy a newly acquired print of St Patrick was blessed by the Archbishop. This print is now proudly on display in the College foyer. Following the liturgy, an assembly was held at which Mrs Helen O’Brien, Director of Catholic Education and Cr Duncan McMillan, Deputy Mayor of the City of Playford, spoke to students and staff. Both speakers commended the college on all it has achieved so far and looked forward to the college continuing to play such a positive role within the region in the future. Special green iced donuts were distributed to students following the assembly to recognise that this was their feast day. The celebrations will continue with the traditional annual ‘Irish Games’ to be played next Thursday afternoon. The St Patrick’s Technical College community is proud of its connection with a remarkable man who continues to inspire young people in our world today. This entry was posted in Latest News, Principal's Blog on 17/03/2016 by St Patrick's Technical College. 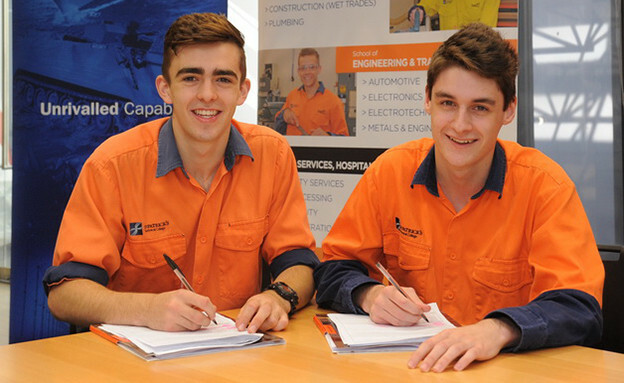 This morning St Patrick’s Technical College reached a significant milestone with the signing of our 700th apprentice. Jared Kirby, 18, of Blakeview, will carry the #700 as a school-based Electronics Technician apprentice with Australian Industry Group Apprentice & Trainee Centre, hosted at BAE Systems Australia. Joining Jared at AI Group / BAE Systems is StPatsTech #701, Rhys Ferrari, 17, of Golden Grove, also signed this morning into the same school-based apprenticeship program. “Our 700th apprenticeship commencement is a milestone of which we are enormously proud,” remarked St Patrick’s Technical College Principal, Mr Rob Thomas. Learning on Monday that Rhys and Jared had both been successful in their application for, what was initially, one position available at BAE Systems, the College was faced with something of a quandary as to who would be recorded as #700! College Business Development Manager, Mr Patrick Kelly, arrived at the solution with an interesting sub-plot. “After receiving advice of our 699th apprentice in early March, we were aware that the next commencement was to be number 700,” commented Mr Kelly. Although Jared won the toss to be acknowledged as #700, Rhys did get to keep the $1 coin! Mr Gauci worked at BAE Systems for 24 years completing his apprenticeship there as an Electronics Technician himself in 1989, going on to a career as an Electronics Engineer. After achieving his teaching qualification in 2014 and having undertaken practical teaching stints at St Patrick’s Technical College as part of his course, Michael joined the StPatsTech team following his graduation. Michael’s knowledge and employment experience are typical of the teaching staff that have been assembled at St Patrick’s over the years. The real-life experiences, advice and guidance this provides to students has undoubtedly assisted many hundreds of StPatsTech students, like Jared and Rhys, to gain employment in their chosen fields. Rhys and Jared undertook a Certificate II in Electronics with Mr Gauci as the core component of their Year 11 program in 2015 and had commenced their Certificate II in Electrotechnology (Career Start) as their Year 12 focus this year with electrician and qualified teacher, Ms Linda Burton. 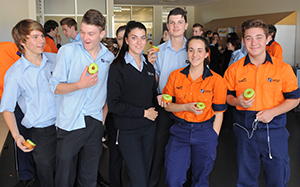 Both pre-vocational qualifications are delivered as part of the College’s unique cooperative agreement with TAFE SA. This involves a VISA agreement for the Electronics qualification and delivery under the state’s only Work Ready sub-contract for Electrotechnology. Employment outcomes such as today’s 700th, are the result of St Patrick’s Technical College’s unique combination of a trade-focused SACE curriculum, the pre-vocational training program developed in partnership with TAFE SA, our dedicated staff team and the significant input and support from local industry. Not to mention outstanding young people such as Jared and Rhys! Congratulations boys. This entry was posted in Industry Office, Latest News on 11/03/2016 by St Patrick's Technical College.